Is this a review of W.A.S.P. 's "The Neon God Part I - The Rise" or "The Crimson Idol Part II"? 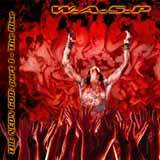 After reading this review, do a search in our data base for W.A.S.P. 's - "The Crimson Idol" and you'll see what I'm getting at. Blackie Lawless is a master at re-inventing himself. He takes the formula used on "The Crimson Idol" album and re-hashes the same old riffs, melodies, vocal styles, etc. re-arranging everything to create "new songs". The only thing that is different is the story and lyrical content, though the subject matter once again revolves around a boy. It only makes sense that Blackie went back to something that was his finest and most mature effort as a musician both musically and lyrically. His approach to "The Neon God Part I - The Rise" is very similar to the one AC DC has used throughout their career.. Regardless, Lawless has released another strong effort. He has once again taken The Who's "Tommy" route. Like "The Crimson Idol", "The Neon God Part I - The Rise" is also a conceptual rock opera. It explores the tragedies and consequences of one boy's search for acceptance and purpose in his existence. The boy, an abused orphan, discovers he has the ability to read and manipulate people. By using these gifts, he is able to create a loyal following of people who are devoted to him and pledge their allegiance to him to the point that the boy is on the verge of becoming the dark Messiah for the 21st century. (Did someone say, Damien?). The boy is faced with questions such as "where does one fit into the great cosmic enigma? ", "how does love fit into the equation? ", and "should I use my talents for good or evil?". Lawless once again has Frankie Banalli on drums, Mike Duda on bass and Darrel Roberts on lead guitar. The presence of the hammond organ and keyboards, acoustic and clean electric guitars, buzz saw guitar riffs, insane drumming, screaming, wailing, banshee vocal throttles, etc. are all there. The first song, "Overture" pretty much gives the listener an overview of parts from different songs throughout the album, setting a theme that will be reprised a few times within some of the songs. "Wishing Well" can almost be mistaken for "The Invisible Boy" from "Crimson Idol". "The Red Room of the Rising Sun" has a psychedelic feel to it and sounds as if Blackie listened to a few Beatles albums before coming coming up with this one. A mix of something between "If I Needed Someone" and "Tomorrow Never Knows". "The Neon God Part II" is due out this summer and will bring the story to it's conclusion. Maybe Blackie should rename it "The Crimson God" or "The Neon Idol". My guess is that it won't sound much different from this one. I'm not sure why he decided to release two full length albums so close together. Maybe it would have been easier to release as a double album at a special price. Oh well, fans of "Headless Children", "The Crimson Idol" and "Still Not Black Enough" will like this album despite the repetitiveness. I even find myself liking it more and more with each listen.